You can't hurry love, but, lovely Mother Nature, let's hurry winter! 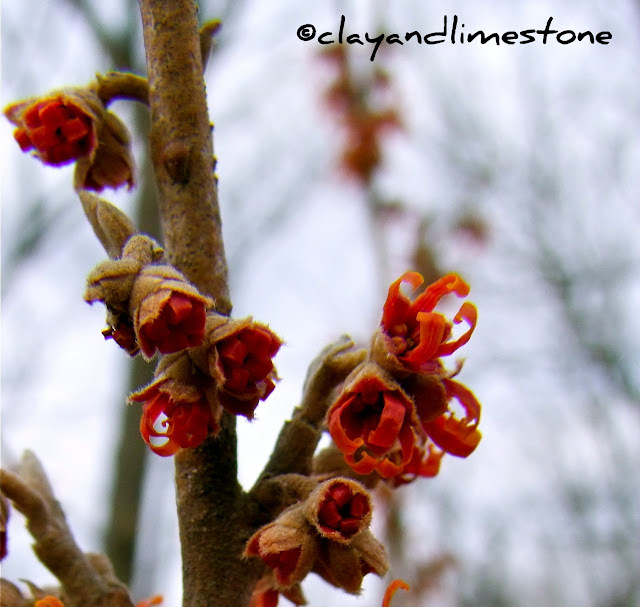 It's time for my winter blooming beauty Hamamelis vernalis to wake up! The anticipation is making me impatient! Last year's bloom; this is why I am SO excited! It's been unseasonably warm. Too warm and too confusing for the plants in my garden. I just noticed that Hedge has blooms and there's even a few daffodils in the next garden over nodding in the sun. Dear Mother Nature, it's time to jump start winter into action. I know I don't need to tell you that most perennials need a cold, dormant period (vernalization) before germinating; but, winter blooming shrubs, like witch hazels, need vernalization to signal the plant to begin blooming. So, dearest Mother Nature, feel free to bring on winter and a bit of snow. PS One more thing, we don't want winter to hang around any longer than absolutely necessary for flowering power! Oh, I like that last tidbit. We certainly do not want winter to hang on later than the first day of spring. Enjoy this day. I do understand your eagerness Gail...I hope we get to see photos from this year's bloom soon! Couldn't have said it better Gail...my plants are growing with no snow protection...and the deer are browsing and munching on early blooming bulbs..yikes...and plants I have never seen them eat but the new green growth is too tempting....I hate the fact that the voles will be burrowing all over under the snow, but the plants need the snow...we are headed for a major storm sometime today and into tomorrow....never thought I would be wishing for snow....but only enough as needed and for as long or short a time as needed..
Our poor, confused plants! What's a gardener to do? It is so good to know you are out there. My garden like yours is in a state of confusion. We are still waiting for winter to arrive. May Mother Nature hear your plea and send you winter to help 2012 be a wonderful gardening year at Clay & Limestone! We need winter here and it seems like we are finally getting it today. I'm actually glad to see a bit of snow. Wow. I haven't been able to do much blogging during the holidays... reading your post this morning and the comments highlight the fact that many of us are still waiting for Winter. And waiting and waiting... We did find some snow in the mountains above us, but the ski resorts are in a panic. I'm feeling the same way this winter...there are so many plants in my garden that are still green...they need to go dormant at some point...can't imagine what will happen if they don't get their winter rest before next spring. I have to admit to enjoying the mild winter so far this year as I have had a chance to catch up but now I am ready for spring and need some cold to help things germinate. 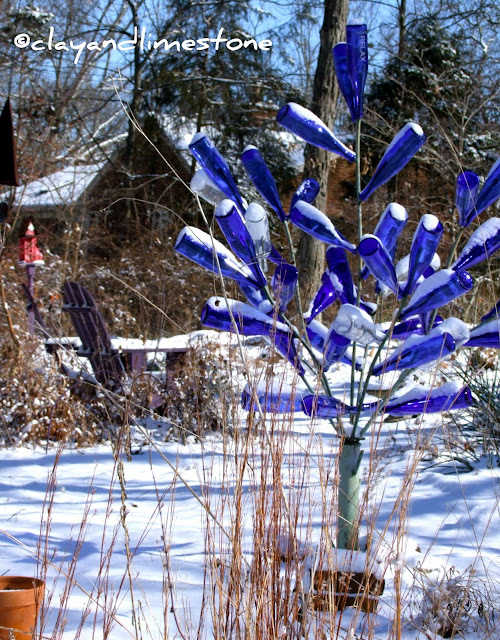 I, too, love your bottle tree! i've been saving blue bottles for just this purpose. How about some hints on how this is put together? what is the basic structure? Yes, Gail, we need some winter too! Otherwise, it can come in March and kill a lot of new growth! Love your pictures! We are finally getting some winter here today Gail. I was glad because I had bulbs trying to push up. Snowing today and it is a pleasant departure from all of this rain. Maybe this snow and cold will stop the bulbs now. It doesn't look or feel wintery here either. I want winter to come - then go in a timely manner so we can get to spring. I love your message in this post and it looks like cold will visit us (for a bit)! Our plants (native and otherwise) are definitely confused by the warm temperatures so far this winter. I saw the post title and knew this was one for me. I too feel winter is taking a siesta and needs a little push to wake up. So strange to hear how warm it is in a lot of the country when we've had snow cover for over two months. I wish I could send you mine ~ I'm ready for a break! Hopefully you'll get some winter soon & Happy New Year too dear Gail. I'm glad you added that final comment, Gail:) The cold has arrived here, but it's supposed to be short-lived. I can't believe I'm saying this, but I'd like a little snow, too, to insulate my plants. Just no blizzards like last year, please. Wishing you a very, very Happy New Year, Gail! We've had cold, lots of it, all through December, but we're really behind on rainfall (about 30% of normal at the moment). Winter does seem a little out of sorts for a lot of us at the moment. Hope you get your required winter chill soon. Happy New Year! The Good Momma heard you. We are frozen here. Wind chills in the single digits. Brrrrr. It is not to last for long. WEIRD. What ever it makes for interesting goings ons. Happy New Year. Wishes to you for a Happy New Year! Hillarious you asking for Snow and colder temps as I have old man winter at my doorstep and am heading for warmth and sunshine in the Sonoran desert! The blue bottle tree does look great surrounded by white snow!